I forgot to include it in the bigger picture and was too lazy to start over. Two coats of Paper Mache on all fingers. Then, I put a big ole blob of Ski Teal We Drop on a piece of paper, dipped the sponge in it, and tapped the polish on top of the white. Err...when the white was totally dry, that is. 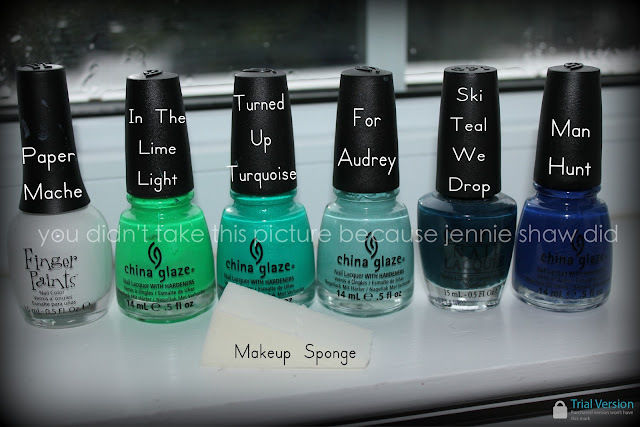 I repeated the process with Man Hunt, For Audrey, Turned Up Turquoise and, finally, In The Lime Light. After I was done, I thought it needed some pizzaz so I added a thin-ish line of Make A Spectacle along the top. It kind of reminds me of an impressionist painting. Like if Monet was a girl and wanted to have a mani that matched his (her) interpretation of a pond full of lily pads. Oh man, did I really just type that? I may be somewhat too sleepy to be drafting this post. But it is what it is. Haha! Can't wait to try this!!! One question - the sponge should be wet or not? I keep reading different things. What did you do? I love all the colors!! Great job once again. 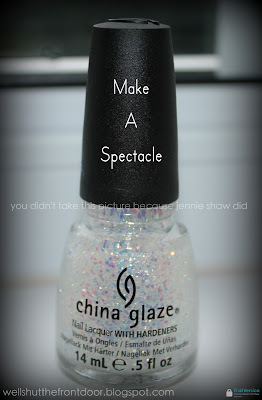 Love that "Make a Spectacle" great glitter! Love the color family as well! That's awesome and unique! How long did it take you to do that? Hi, found you through the Nail Files link up. Your mani looks awesome! love all those shades-teal is one of my fav colors! Looks great! Love the sparkle tips, too. The Ombre' look is one I've been wanting to try for a while...I just haven't yet. I may have to figure out what colors in my stash I want to use and give it try this month sometime. Your nails are looking super long! 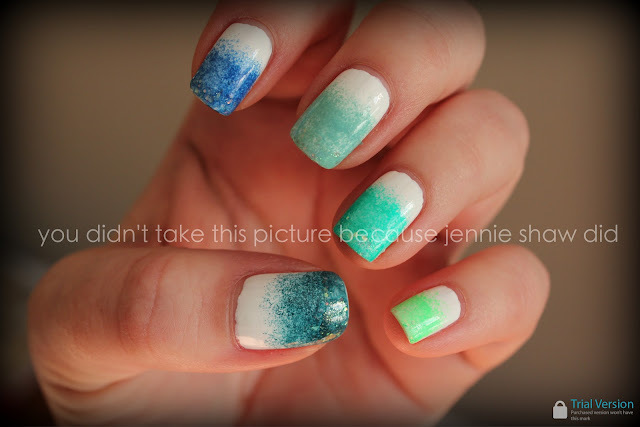 love the ombre! i need to give it a shot again!